Flexible glasses frames are made with a variety of high-tech composite eyeglasses alloys that allow for extraordinary bendability. 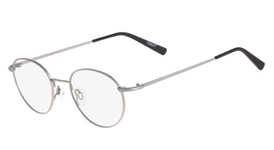 Although flexible prescription glasses frames aren't guaranteed to not break, they do withstand more abuse. Here are a few samples of our favorite models of flexible eyeglasses. But for a much larger selection of flexible glasses check out these brands in the brand list: EasyTwist, Flexon, Tura Flex. Flexible eyeglasses are really flexible in the shaft of the temple, and the nosebridge. However, flexible eyeglasses are often designed with some non-flexible parts, to allow for fitting to your face. For example, the nosepad arms on flexible eye glasses are usually not made front he flexible material. Also, while the shaft of the temples are flexible, very often the tips of the temples are not made of flexible material. This is so that the tips of the temples can be adjusted to fit and stay around your ears.